nun ist es soweit und wir haben weihnachten. zu allererst möchte ich mich an dieser stelle für eure treue und die lieben kommentare im ganzen jahr bedanken. ich freue mich immer sehr darüber und geben mir weiteren ansporn. ihr startet unserem blog hop bei unserer lieben aud und seid nun bei mir gelandet. wenn ihr dann direkt weiter geht zu claudia, dann seid ihr auf dem richtigen weg. ihr könnte auf jedem der einzelnen dt-blogs gewinnen, wenn ihr dort einen kommentar hinterlasst. auf jedem blogs findet ihr dann die tollen karten zum sketch einen anderen sponsor mit einem tollen preis. mo manning sponsored dazu einen gutschein von 6 $, was 1 oder 2 ihrer supersüssen motive entspricht. so nun möchte ich doch noch ein paar worte zu meiner karte sagen. den sketch hat meine liebe freundin claudia gestaltet und er inspirierte mich direkt zu einer gatefold-card. meine freundin tina hatte ja schon alle meine weihnachtskarten gesehen, also wollte ich für sie eine neue (ungesehene) karte gestalten. ihr sohn matthias liebt ja häschen und so war für mich klar, dass ich mo´s supersüsse hasenmotiv mit dem möhrengeschenk (bunny with gift) benutzen werde. bei einer gatefold-card muss natürlich auch der innenteil gestaltet sein, da eignet sich das my minds eye papier doch auch prima. nun wünsche ich euch ein schönes und besinnliches weihnachtsfest mit euren lieben, lasst euch reich beschenken und genießt die zeit miteinander. 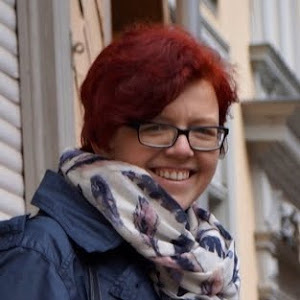 viel spass und glück beim blog hop, nun weiter zu claudia, dann seid ihr auf dem richtigen weg. the countdown is over and we have christmas. at first i want to say a big thanks to you all that you have visit me the whole year and leave me such a lot of sweet comments. that make my day all the time. you start our blog hop on the blog from our lovely aud and now you are landed on my blog. if you go to claudia, then you are on the right way. on each dt-blogs yon can win an other prize, if you leave a comment. there you find not only different sponsors from all over the world also the sweet sample cards to the wonderful sketch. mo manning sponsored for the blog hop a coupon with 6 $ for 1 or 2 of her sweet images. but now want to tell you only some words to my card. the sketch has designed my dear friend freundin claudia and it inspired my to create a gatefold-card. on a gatefold-card you also have to create inside of the card and the my minds eye papers are really perfect for that. now i wish you wonderful and peaceful christmas holidays with your family and friends, hope you will get a lot of sweet gifts and please enjoy the time together. a lot of fun and good luch with the blog hop, and now go to claudia, there you are on the perfect way. Hi Bea wow this is a stunning card, love the cute rabbit and fab design. Thank you the chanc eto win this great candy. What a great card, that image is adorable!! Like the added accents on the edge of image~~Perfect!!! Beautiful gate fold card! Love that bunny image, too. Thank you for the chance to win! What a fab card and such a cute image too, I wish you and yours a very merry christmas and a happy new year and thanks for sharing. Lovely bunny! This week's sketch is so nice! Thanks for a chance for a coupon, I love Mo's images! This is so adorable! I love that cute bunny and the papers that you used! Terrific card! Oh Bea, that is one cute rabbit. And then to have the carrot gift wrapped is wonderful. Thank you for all your lovely cards this year. Wishing you a wonderful Christmas and all the best for the New Year! What a wonderful card, love the big bow, this cute image and the beautiful inside too. Cute card, thanks for the chance to win. A very beautiful card...thanks for sharing it. Merry Christmas to you! and best wishes for 2011. Love your card ... that insert with its border is stunning! Wunderwunderschön. Und was für ein zauberhaftes Motiv. Ein schönes besinnliches Weihnachtsfest wünsch ich Dir und Deiner Familie. Wunderschöne Weihnachten wünsche ich dir Bea und natürlich auch deiner Familie. Deine Karte ist einfach zuckersüss, ... das Motiv ist zu niedlich. Danke, für die Chance, deinen tollen Preis zu gewinnen. Bea, your card is so jolly, love the image and the DP everything look so beautiful. What a cute bunny and as soon as you said Gate Fold, I thought HOW PERFECT!!! love the papers and the inside is adorned just right! Happy Holidays ! PS-thanks for the chance at some of Mo's stuffs! Beautiful card! Your coloring is wonderful. Oh Bea this is absolutely gorgeous hun! what a beauty! Love your coloring!! Wishing you a Very Merry Christmas and a wonderful 2011! Dein Kaertchen ist Zuckersuess....wunderschoen gestaltet! Gorgeous card Bea.Wishing you a merry christmas and a happy 2011. What a super cute card. I love stopping by your blog often and always enjoy your creations! Merry Christmas! What a lovely card and a real nice image. Have a nice Christmastime! great card thanks for the chance to win. What a cutie Bea ... and great coloring. Fab card, Bea - I love the image, papers and that beautiful big bow. Your card is gorgeous. Thanks for the hop and Happy Holidays! LOL! Your rabbit is sooooooo cute! What a fun, creative & inspirational card! oh this is just adorable! That image is so cute and all your details are fabulous! That ribbon is gorgeous too! Have a wonderful Christmas. Beautiful card! Love the inside! Gate fold cards are one of my favorites. Great card. The rabbit is so cute and I love the lush ribbon! Your card is so festive and sweet. The inside looks as pretty as the front as well! WoW! What a beautifully detailed card. I love Mo Mannings stamps. This is such a cute image. Thats a beautiful take on the sketch. Lovely gate card Bea. Thanks for giving me a chance to win the prize. Mery Christmas . Beautiful card. Liebe Bea, wünsche dir und deiner Familie ein frohes u. besinnliches Weihnachtsfest. so cute of an image! Merry Christmas to you all! Great card! I agree the bunny image is adorable! Thanks for the opportunity to win something on the blog hop! OOOH I want this bunny! !I love your card,it's fabulous!! What a lovely rabbit and so cute, Merry Christmas!! euch auch wunderschöne Weihnachten noch. Schade, das ihr nicht kommen konntet, aber ich verstehe es. Bei uns ist manch ein Gast auch nicht bis nach Wiederau gekommen. Ein Wahnsinns-Weihnachts-Wetter! Wenn man nicht weit weg muss, ist es richtig traumhaft. What a lovely card, Bea. The stamp is absolutely georgous. Thank you for the change to win such a lovely price! Hugs, Renata. Sweet card - love the dp and the embellishments! Thanks for the chance to win and Happy Holidays! Lovely card, lovely blog and so fun christmas surprice. Wow, what a gorgeous card!! Love it! Wonderful card. I love all of the sparkle! Darling card with such a cute image! What an adorable card Bea! I love the cute image and fabulously decorated inside and out! Hi This image is great for the little bunny lover. I love the gatefold idea. I hope you havea great new year. Hi Bea, Stunning card using the lovely sketch. Super cute image and love all the glitter. Hope you had a wonderful Christmas. Adorable card, so sweet. ps love the christmas tree picture too! Happy Holidays. what a fabulous card....it gives me lot of inspiration! I love your card. The little details are really nice.that bunny is soooo adorable. Thank you for the opportunety to win a prise. Such a sweet image! Pretty tree too. Your bay window is gorgeous! Happy Holidays! Fabulous card and love that sweet image. Thank you for a fun hop (hope I loose a few pounds lol) and a chance to win. Such a sweet image, for that little bunny to be giving away his delicious carrot, how thoughtful!! Very cute card, your colouring is gorgeous!! Wunderschön!! Deine Karte gefällt mir sehr gut! :) Supersüss!! Ich muss weiter, blog-hopping - Claudia nächst!! Vielen dank, die Möglichkeit süsse Mo Manning digi stamps zu gewinnen! Beautiful card Bea! Love these cute images!! Such a cute bunny - I love his hat - and you've made a gorgeous card. This is adorable!!! Love your coloring! Merry Christmas Bea, wonderful card and I love the twist of a gatefold card. Thanks for a chance to win candy on your blog. What a lovely card! TFS. Thanks for a chance to win candy. I love your gate card, it's such a great idea. And your image is adorable! Your card is so beautiful. Love the rabbit :-). I love your card: the rabbit is absolutely addorable!!! I love your card! It's really sparkly. Gorgeous gate fold card! I love the inside too and that cute bunny image! That image is just too cute and I love how the inside of your card is just as gorgeous as the outside. You have made a very nice card with a christmas bunny :).